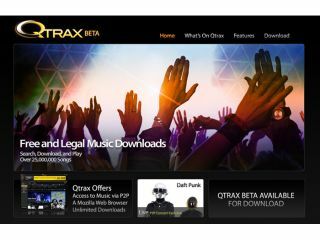 A year after it seemed to disappear, the controversial legal peer-to-peer download service Qtrax is back - with a deal allowing it to distribute Warner Music's entire music catalogue free of charge. Qtrax uses an ad-supported delivery model that "easily and accurately" directs revenue back to artists and rights holders, and relies on Windows Media DRM. Qtrax is still making big claims - promising a "colourful and diverse" catalogue of high-quality digital music files that will "eventually" number "in the millions". Like illegal P2P downloads, Qtrax users download and install a client to search for and download music files. Unlike Torrents clients though, all Qtrax files are encoded with DRM that means you can't copy them to your mates or load them on to your iPod. However, they should work on all Windows Mobile devices "in the near future". Files can only be played back through the Qtrax player, which includes ads and sponsorship that covers the licensing price of the track. The player must be connected to the internet to play songs. The player is built on the open-soure Mozilla platform, has brower, genre and playlist features - and will be able to play back files bought using iTunes. President and CEO of Qtrax Allan Klepfisz says, "The Qtrax platform incorporates a unique legal peer-to-peer experience that we strongly believe will compete favorably with illegal sites and will prove the ad supported model to be a viable and valuable alternative in the future monetizing of free music." At the moment, Qtrax is only available to US users. Somehow we can't see the rest of the world crying too hard.